Earlier this year Larry Swanson blogged about the incredibly irresponsible paper published by Oregon State University, intended to “evaluate the effectiveness of a three-month-long treadmill desk intervention in eliciting changes in objectively monitored physical activity and sedentary behavior among overweight/obese office workers.” This article rapidly became fodder for internet sites pumping out sensationalist headlines exclaiming that anyone who purchased a treadmill desk with the aim of losing weight was a fool for doing so, because new “research” had shown no evidence of weight loss benefits. Here we go again, this time with a poorly-designed research study from Brigham Young University that click bait internet sites are pumping out into the cyber-sphere as proof that treadmill desks cause a reduction in cognitive skills and productivity – exaggerating the study’s results without mentioning its methodology’s weaknesses and shortcomings. In fact, the researchers themselves concluded that any differences in cognitive ability they found don’t outweigh the health benefits of a treadmill desk, and that their own study had several weaknesses. As long time watchers of the treadmill desk industry, and having read every study conducted in this arena, we were disappointed by both the improper methodology used in this study and the wrongful conclusions that internet media outlets hastily made in crafting their grabby headlines – and are again dismayed by how rapidly the internet promulgates such nonsense. Considering the health benefit that could be provided to many sedentary workers suffering from back pain, obesity, diabetes, fatigue and general poor health by adopting a treadmill desk, BYU and all the websites who published some abstract of their study – including the New York Times – have done great harm in doing so for the sake of generating some incremental website traffic. We’ve highlighted the study’s shortcomings, and how researchers can improve their methodology to more accurately reflect real-world treadmill desk use, below. We know from our readers and customers that the average treadmill desk user is a high-earning, highly-educated professional, typically over 35 years old, who is strapped to a computer all day in a sedentary job. Lawyers, accountants, writers, software coders, etc. Most often they are driven to standing or walking at their desk by back pain and fatigue, and, for a minority, simply for metabolic reasons. In general we find that reporters, researchers and industry advertisers overstate the case for weight loss, which is clearly a minority concern compared to the more common forcing factors of back pain and fatigue. In other words, these participants looked nothing like the actual target audience for a treadmill desk. The researchers admitted as much in their study, stating “… the sample consisted of university students that may not be representative of individuals in the day-to-day workforce.” Not only were they far younger and healthier than the typical user, they were not sedentary office professionals, and haven’t been typing at a desk, in a “computer hunch” position, for at least couple of decades. They were fit, avoided smoking and alcohol, got plenty of sleep, had no physical injuries or disabilities… perfect specimens. The researchers even excluded ADD/ADHD sufferers, who are usually noted as having the very highest productivity benefit from treadmill desking. 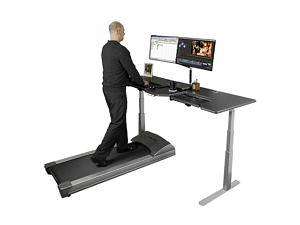 When adjusted properly, a treadmill desk workstation can dramatically improve worker productivity and well-being. We’ve written tons of content about the importance of a proper ergonomic setup when treadmill desking. 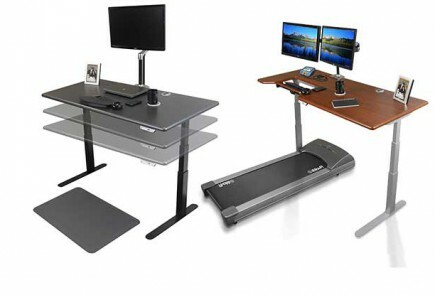 A good ergonomic keyboard tray – or better yet, a desk with a built-in keyboard tray designed specifically for treadmill desking, like the iMovR Omega desks – and an ergonomic monitor arm are absolutely essential. No such luck here… the tiny 37″x24″ desk provided was set up as poorly as can be for use with a walking treadmill. Even an experienced treadmill desk user who has been working at a proper setup would have a very hard time adjusting to the non-ergonomic configuration that was used in this study. Not only that, but the researchers used both a single, fixed speed of 1.5 mph and a fixed-height desk for test subjects. We know that the optimal speed and desk height vary among users, and an inadequate, ergonomically-poor setup like the one described can definitely contribute to a decrease in cognitive outcomes. This is, for us, the most problematic aspect of the study. If you know anything at all about conducting scientific research you’d be hard pressed to imagine any useful findings in a study that takes people off the street and has them do something they’ve never done before for only 45 minutes. Working at a treadmill desk is a lifestyle change, and like any such change some period of acclimation is required. The researchers admitted that they gave study participants just five minutes to get accustomed to working on a treadmill desk, which is simply absurd. How is that supposed to reflect the real world? Anyone introduced to a strange new desk with a strange new, (and non-ergonomic) keyboard, set flat on that desk, and a monitor set to an ergonomically incorrect height, is guaranteed to take a hit in their typing speed and accuracy – even without a treadmill underfoot. In fact, a more comprehensive year-long study found that workers’ productivity improved week after week on a treadmill desk. We hypothesize, based on our collective empirical experience both learning to use a treadmill desk ourselves and assisting many people in making the transition, that the walking is not the problem. We’ve all known how to walk naturally since we were tots, and working at a treadmill desk doesn’t require you to relearn it. The problem is the lack of an adequate ergonomic setup and break-in period to get used to this particular desk and keyboard configuration. This is what created the distraction, and hence reduction, in these study subjects’ cognitive abilities. All we can say is that next time, these researchers should have do some of their own research in advance to select an appropriate group of participants, set up an ergonomically-sensible treadmill desk, allow participants a day or two of getting used to the setup before beginning to measure their performance, and conduct the study over a period of weeks or months to accurately reflect users’ real-world experiences – not 45 minutes.